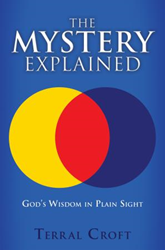 Within the pages of Terral Croft's new book, The Mystery Explained: God's Wisdom in Plain Sight, ($52.99, paperback, 9781545620717; $65.99, hardcover, 9781545625897, $9.99 e-book, 9781545621424) readers will find an instructional manual written to help readers recognize God's wisdom hidden wisdom. Using God's three witnesses of spirit, water, and blood, Terral guides readers step-by-step through seeing what normally goes unnoticed by the worldly eye. With color-coded diagrams, Greek definitions, and scriptural evidence, Terral breaks God's true Bible Code. "The information shared in The Mystery Explained has remained hidden until revealed in my ministry," states the author. "The Mystery Explained is unique in that readers are introduced to God's true Bible code revealed in the testimony of His three witnesses of spirit, blood, and water. Understanding the relationships between Bible witnesses leads to the realization that all spirit, water and blood witnesses are testifying about one another from Genesis to Revelation." Terral Croft is a meticulous researcher and advocate of the truth. Terral's aim is to share the fruit of his research with others so that they may live may live with more awareness. The author's previous work includes The 911 Truth: Exposing the Cheney/Rumsfeld Black Operation. Xulon Press, a division of Salem Media Group, is the world's largest Christian self-publisher, with more than 12,000 titles published to date. Retailers may order The Mystery Explained: God's Wisdom in Plain Sight through Ingram Book Company and/or Spring Arbor Book Distributors. The book is available online through xulonpress.com/bookstore, amazon.com, and barnesandnoble.com.